This one’s up a little later than I intended – but only because I was waiting for a special guest host to have some availability in his schedule. Five-timer Scott Lord fell on Monday; since then, we haven’t had a repeat champ. Andy’s going to need some help to break that slide. I’m lucky I have my brother on the show to explain how easy the wagering situation is for at least one of our players. If Tara doubles her score, she’ll have 21,000. To cover this all-in wager, Mags will need to wager 7,800. An incorrect response with that wager will leave Mags with 5,400. To stay above his total, Tara can wager up to 5,100. Andy can wager up to 1,800. A successful doubling will put Andy at 14,400. To cover this, Tara should wager at least 3,900. 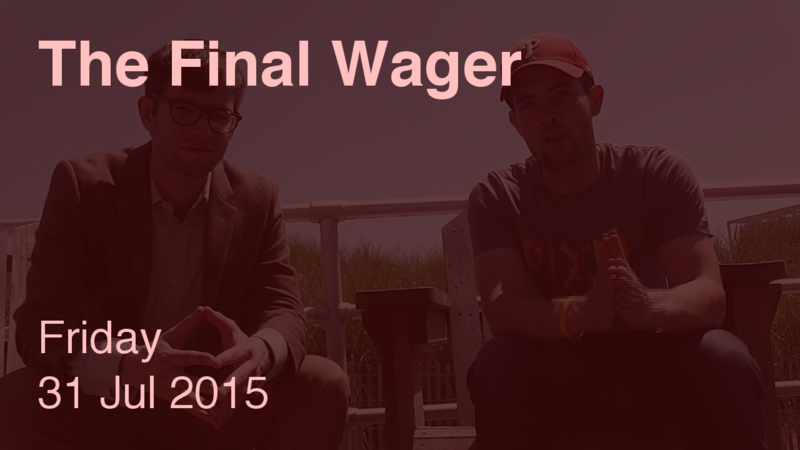 If Tara is incorrect with that wager, Andy can wager up to 600 to stay above her total. On the off chance Mags goes for 1,200, Andy would need to wager at least 4,800 to be in contention – that’s an all-in wager, but questionable. If Tara makes the rational maximum wager of 5,100, Mags will need to wager 2,400 to cover her. If he’s wrong with that wager, he’ll be left with 10,800. In that case, Tara would have to wager 300 and respond correctly. Andy might consider risking at least 3,600. Still all in. Still questionable. If Tara thinks Andy is skittish, she could cap her wager at 1,500. Tara wins despite not following the easiest wagering advice: just wager $4,000. I’m actually tempted to give Andy a pink grade as well, but I’m in a good mood because my next six weeks are a little more free than they have been the last forty-six. It’s been a fun season! Thanks for sticking it out with me – and remember, if you want to help me replenish my liquor cabinet, there’s a campaign for that. And thus ends a season which has run the gamut from great wagering to absolutely horrible blunders. Hopefully, the slight improvement on average from last season to this season will continue, and maybe we’ll finally see the first regular season tiebreaker. How do you know the schedule, Keith?